Chinese President Xi Jinping is “stepping up” as the new defender of globalism. As a populist wave swept through Europe and ushered in the Trump administration in Washington, Xi was in Switzerland vowing to leaders at the World Economic Forum in Davos that China was ready to play a bigger role on the world stage. 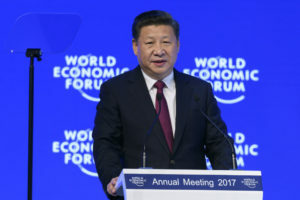 Chinese President Xi Jinping addresses the World Economic Forum in Davos, Switzerland. “At many important multilateral forums, China’s leader has put forward Chinese proposals, adding positive impetus to world development,” Su Xiaohui a senior researcher at the Foreign Ministry-backed China Institute of International Studies, wrote in the overseas edition of the People’s Daily. “In the economic integration process of the Asia Pacific, compared to certain countries who constantly bear in mind their leadership role, what China pays even more attention to is ‘responsibility’ and ‘stepping up,’ ” Su said. Analysts say Xi would not even take the bait on the Trump administration’s remarks about “defending international territories” in the disputed South China Sea. Instead, China stressed its desire for peace and issued a restrained call for Washington to watch what it says. “You have your ‘America first’, we have our ‘community of common destiny for mankind,’ ” retired Maj.-Gen. Luo Yuan wrote on his blog this week. “You have a ‘closed country,’ we have ‘one belt, one road, ‘ ” he added, referring to China’s multi-billion dollar new Silk Road trade and investment program. China’s hosting of an international conference on its “One Belt, One Road” initiative in May is seen as a golden opportunity for Beijing to showcase its global leadership. A diplomatic source familiar with preparations told Reuters that China was likely to hold the conference at the same glitzy convention center used to host the Asia Pacific Economic Cooperation summit in 2014, setting the stage for Xi’s most high profile diplomatic event of the year. Beijing, however, is not expected to back down on its “core issues” – including the self-ruled island of Taiwan. In its first official reaction to U.S. President Donald Trump taking office, China’s Foreign Minister urged his administration to fully understand the importance of the “one China” principle, which Trump has called into doubt and under which Washington acknowledges China’s position of sovereignty over Taiwan.